Notary service is available during business hours. No appointment is necessary. 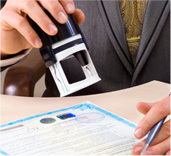 Notarization of your documents require valid identification (Only US Driver’s License or Passport). Notary fee is $15.00 per signature. Please feel free to call Mail Boxes Times at (310) 276–5076 for further questions. Our notaries are fully licensed and insured. They are aware that these are important and legal documents and ensure that you are given superb service in taking care of your notary needs. We provide services at our Beverly Hills store during all our business hours. We also provide mobile notary services during non-business hours or by appointment throughout Los Angeles County including but not limited to Beverly Hills, Bel-Air, Pacific Palisades, Malibu, Century City, Los Angeles, Westwood, Santa Monica, and Culver City.